May 22, 2013 March 19, 2014 filipinocavedivers What is..? What is cave diving? It is scuba diving inside a cave. Simple isn’t it? Not quite. It is a complicated game of the human spirit wanting to perfect skills in the most challenging environment. This is not to scare everyone but cave diving is listed as the most dangerous sport in the world. Although there are many sports like American football, Rugby, horseback riding that may get you hurt or worse end up comatose after a fall, cave diving will not hurt or slowly paralyze but will simply get you killed. 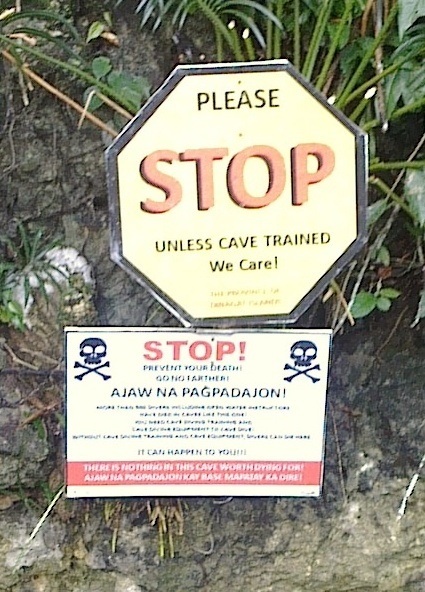 Indeed, cave diving is the world’s most dangerous participatory sport. Per attempt, there are more people who die diving in caves than those who jump with parachutes out of airplanes or buildings. A pure death wish as anybody called it. Tell me in a world of six billion people and counting, how many would like to go into a dark and flooded tunnel, in the coldest water, with limited air and some flashlights. Who gets into cave diving? Very, very few. Like you? Yes, you may get into it as you are past my warning and still reading. Like the pursuit of limits like Everest or Challenger Deep, the underwater world beckons us. What about these caves? They are the natural canals of the world which connect water tables underground. Far from dirty, they are the source of our freshwater. With the right equipment, proper training and enough experience, the once taboo world of cave diving can be a truly rewarding sport or game as well as a lifelong adventure, even with all its dangers. You still reading? Then join us at FCD. Write us and begin your journey to the underworld.